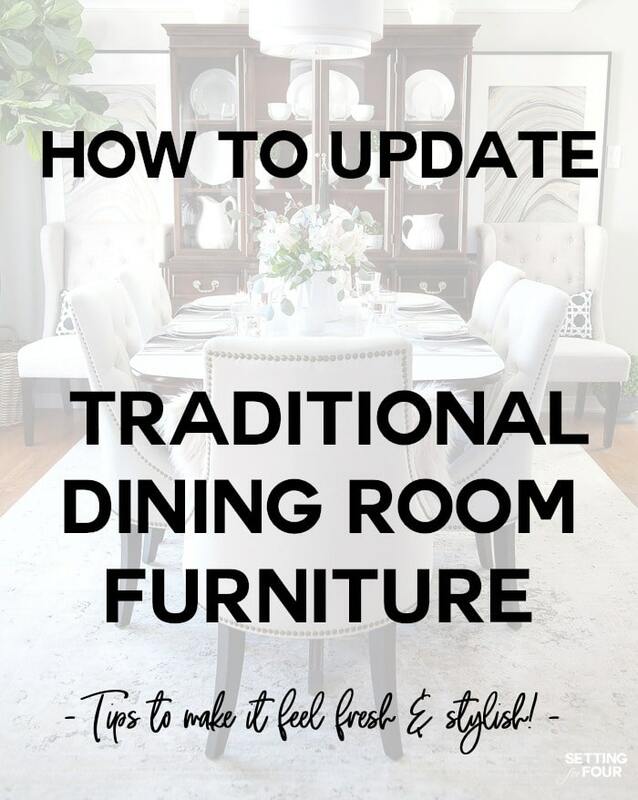 How to update dining room furniture: Learn how to take a dull, boring, dark dining room and make it feel cozy, fresh and stylish! 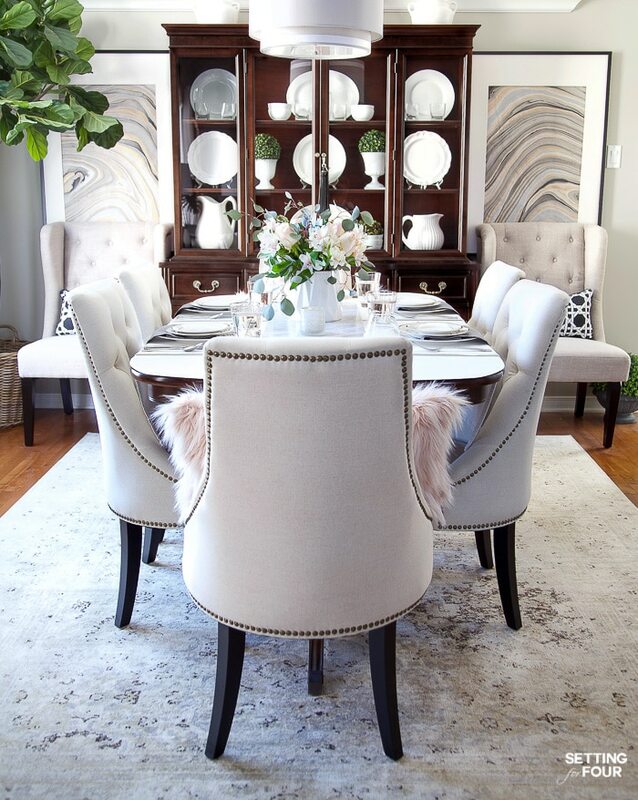 This design lesson applies to any dining room that needs a refresh! This post contains affiliate links, which means that if you make a purchase after following a link I may receive, at no cost to you, a commission on the sale. Funds from affiliates help pay for web hosting, domain registration, and other fees to keep settingforfour.com up and running. Thanks for your support! Click here to read my full disclosure policy. These are all the ideas I used to update our antique Duncan Phyfe style dining room table, hutch and cabinet! 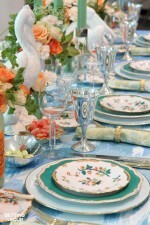 My hubby inherited this set and we’ve used it so much for hosting dinner parties and big holiday meals. Traditional style dining room furniture can look really heavy, dark and dreary and make a dining room look dark and heavy too. But using these design tips will add style and flair to traditional furniture and lighten and brighten your dining room. These 17 design ideas can be used to breathe new life and lightness to any type of dining room! The first decision you have to make is if you will keep your traditional dining room furniture or replace it. If it’s in bad condition and has scratches or damage that can’t be removed with wood polish then perhaps it’s time to sell it or donate it. Donating it to a family member or friend in need, a women’s shelter or thrift store is a great way to pass it on to someone who wants it. You can also sell it and put the money into new dining room furniture! If it’s damaged the other option is to paint it. 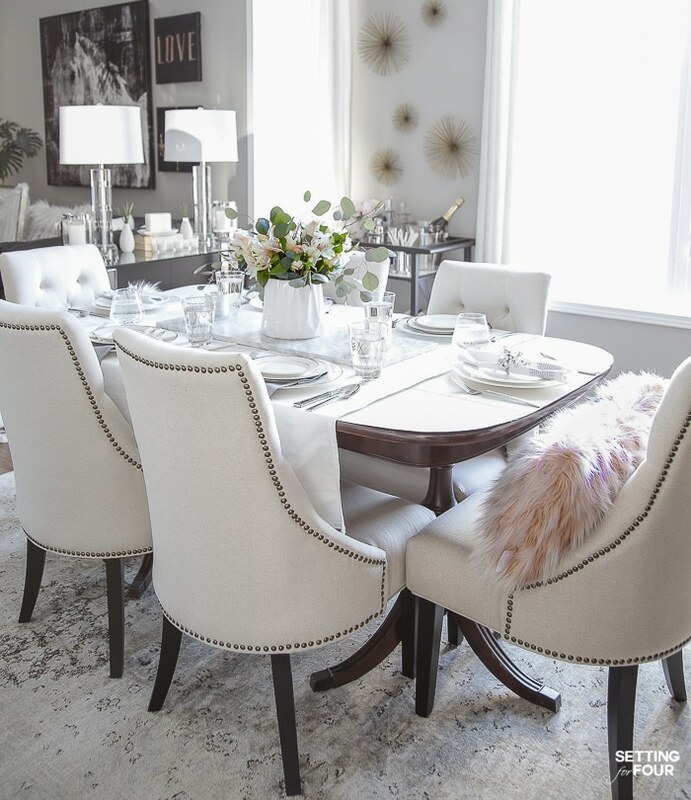 If it’s in great condition and you want to keep it – here are lots of ways you can modernize traditional dining room furniture without getting rid of it. Pick a new wall color that will compliment the color of your traditional furniture! Shop the look! Click on the images below to shop the items. Scroll using the arrows to see them all! 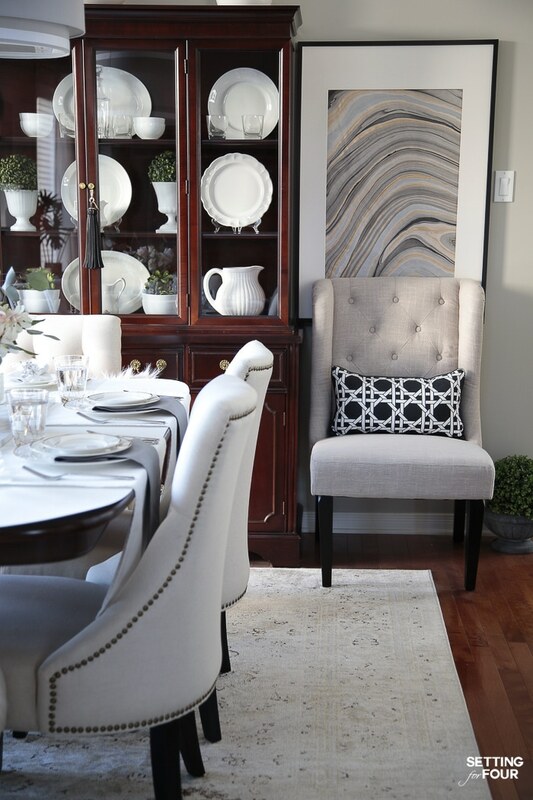 Add more modern neutral colors to your dining room to update the room’s color palette. White, cream, greige, gray and black are beautiful, timeless neutrals that pair really well with traditional styles. Use these colors in your drapery, dinnerware and rug. Also add contrasting, complimentary accent colors such as navy blue , mid toned blue, pink or dark green in your textiles and art. Break up all the formal traditional lines of your dining room set with a second design style. Modern, transitional and some mid century modern styles pair beautifully with traditional furniture! Coastal style also can make traditional furniture look less formal and more casual. Add the second design style in your art, lighting, place settings console table and accent chairs. Replace two head chairs (or all of the chairs) with upholstered chairs in a contrasting color to break up all the wood tones. Remove the hutch and keep the buffet for storage. Hang a mirror or large piece of art above the buffet and add two table lamps to add modern style. Shop the look! Click on the pictures below to see more about each item! Replacing the existing hardware to a buffet and hutch will instantly give it a fresh makeover! Add modern styled hardware like this, or gold toned hardware for an on trend update. Also don’t forget to add a tassel to a cabinet! Tassels are so on trend right now! I added an oversized black leather tassel to our cabinet to give it some drama and impact! 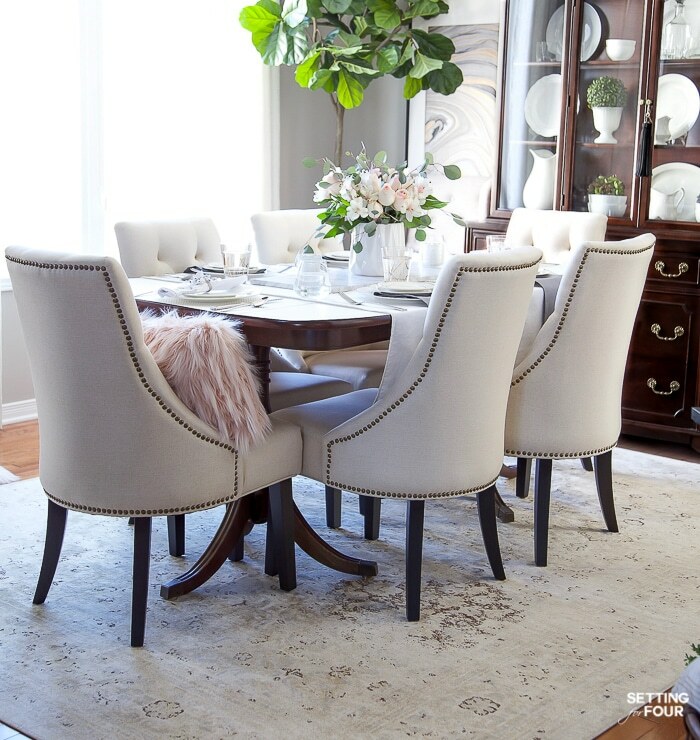 Infuse coziness to your dining room and make it look inviting by adding a rug. Adding a contemporary rug like this one or a vintage distressed area rug like mine will make traditional furniture look more stylish and current. An easy to clean polypropylene area rug with some color and pattern in it is a wise choice considering the food and drink spills that can happen in a dining room. Updating your window treatments is a quick way to give traditional dining room furniture a new look. Add grommet top drapes or roman blinds. Buy linen or cotton for more a casual feeling dining room. If you want to amp up the drama choose silk or velvet drapes. Woven wood shades will give your traditional dining room furniture a coastal vibe. In terms of color, I advise my design clients to stay away from window treatments with prints unless you are willing to replace them often, since printed drapes can go out of style quickly. 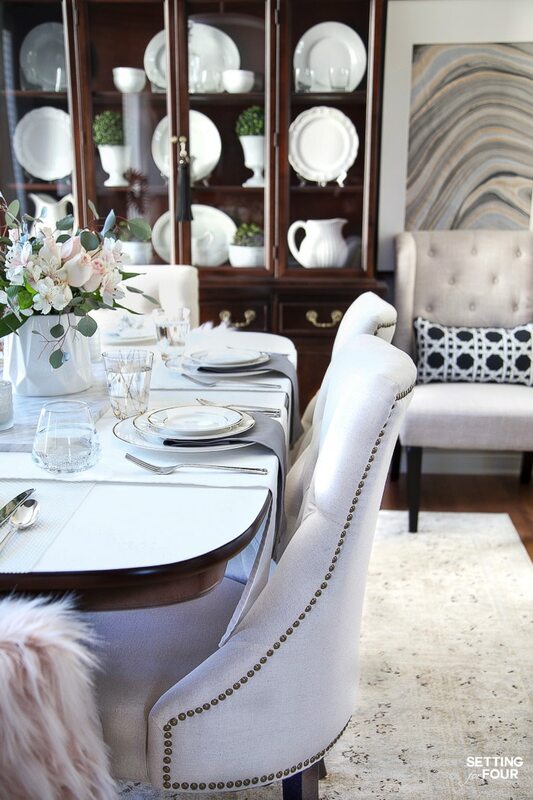 White or ivory colored drapes are timeless and add a gorgeous neutral layer to a dining room. Adding a large mirror above the buffet cabinet will make your room feel larger and add impact to traditional furniture pieces, especially if you choose a transitional style mirror. Add some contemporary art to decorate a dining room and modernize traditional furniture. For instance, I made this quick and easy framed DIY marble art to our dining room and love how it adds a more contemporary look! Adding one large scale art piece or creating a gallery wall of prints is another beautiful way to add a fresh new look. Stay away from adding one or two small prints to each wall because that will make your dining room feel cluttered and dated. On another wall I added these fun gold sea urchin wall sculptures – I love the impact they give our dining room! 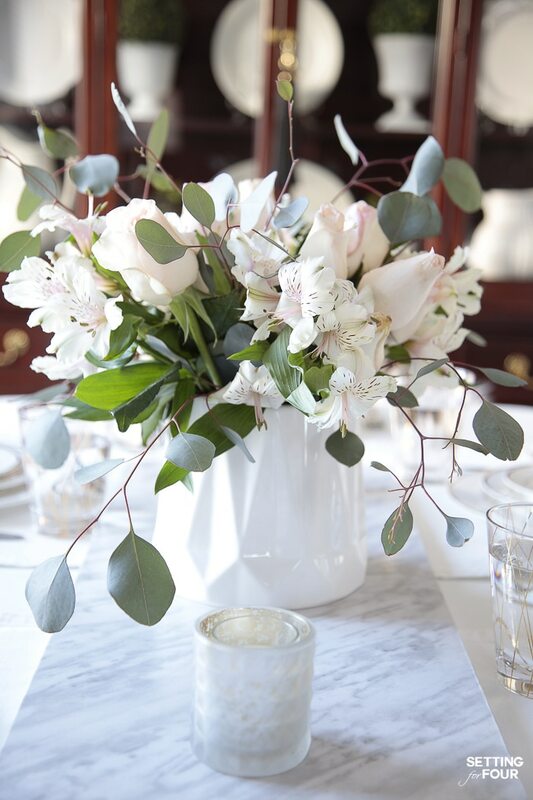 Always, always, always add greenery or flowers to a dining room to breath life into it and give it that designer look! A tropical tree like a large palm or fiddle leaf fig tree is a great way to fill an empty corner in your living room. Olive trees are really on trend now too. I added this 6 foot tall fiddle leaf fig tree in a basket to our dining room and I just love how it instantly updated our dining room set! 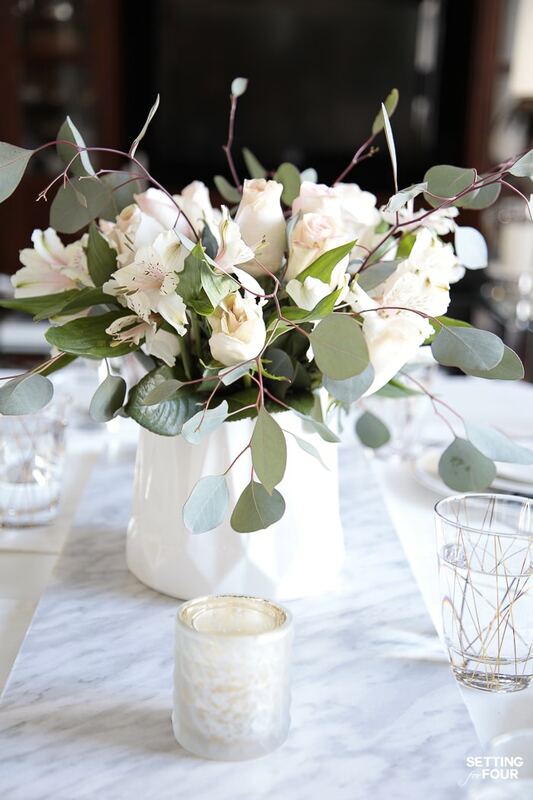 Adding fresh or faux flowers and plants to the table and console table is a great way to add a pop of color and greenery! 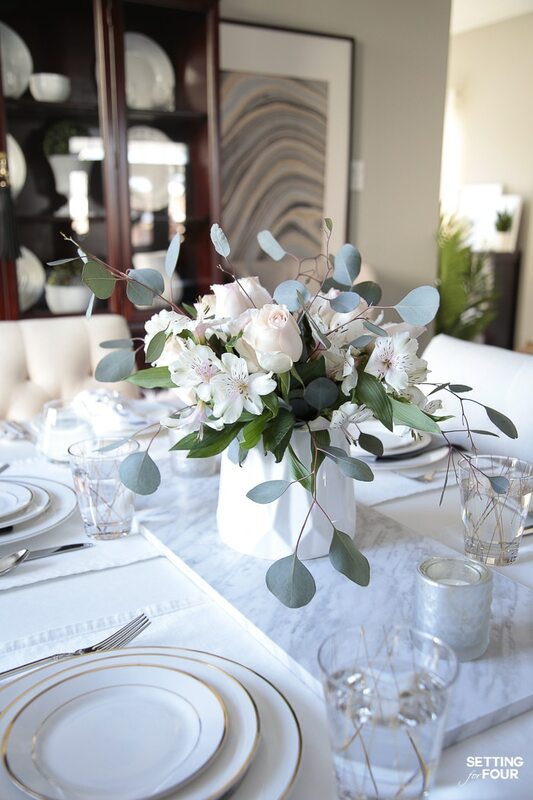 A quick way to update your dining room furniture is to add a floral centerpiece to the center of your dining room table. During the summer I love using flowers from my backyard flower garden but in the winter I usually use flowers from the grocery store. 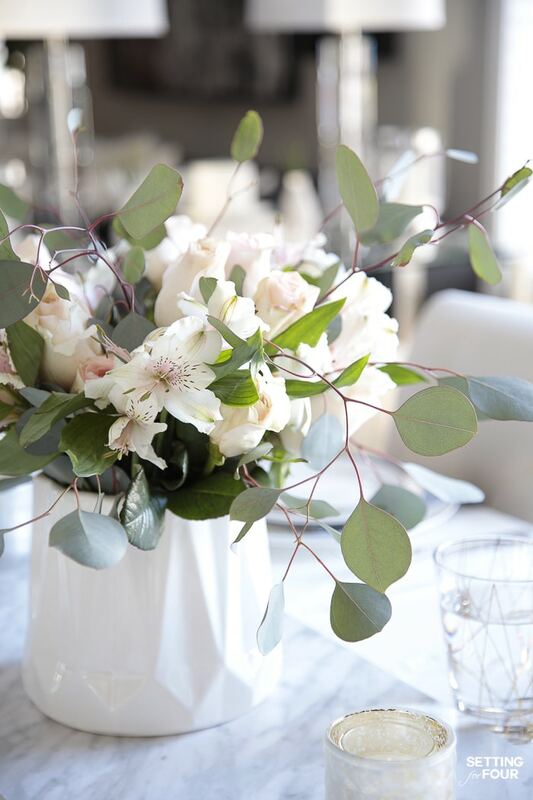 One bunch of eucalyptus and one bunch of pale pink roses and one bunch of white and pink Peruvian Lily (alstroemeria) – that’s it! 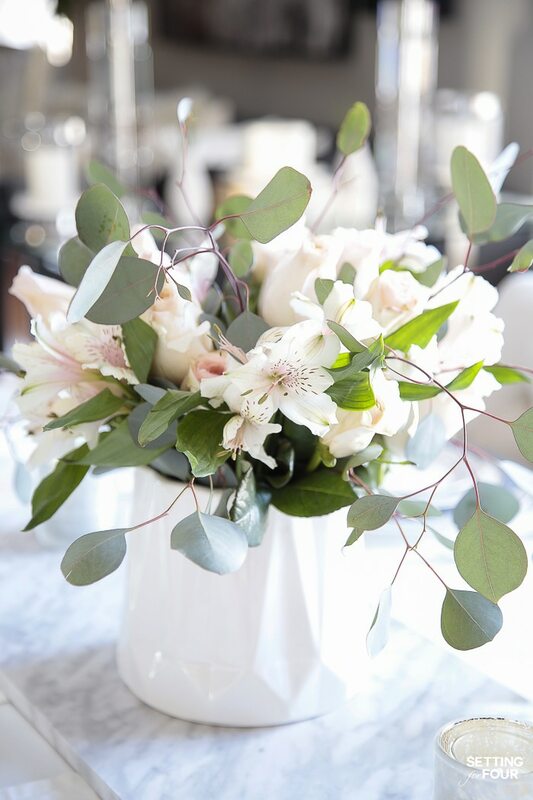 These inexpensive grocery store flowers look like a million bucks paired together in a white vase! These flowers last a long time too! In my opinion every dining room needs a bar cart! They are so gorgeous and fun to style and display liquors and glassware! I love decorating mine for the holidays too! A bar cart will instantly give your traditional furniture a fresh look – plus it offers more storage too and we all need as much storage as we can get in our homes! 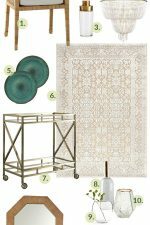 There are actually so many ways you can use a bar cart in a home – they are so multi-tasking and functional!! 15 Creative Ways To Use and Style A Bar Cart! I’m obsessed with candles! I love using wax taper candles and pillar candles, but I especially love using these battery operated, dancing flame candles – they are so realistic! Plus they have timers so you can time them to automatically turn on at dusk to add ambiance and make a dining room feel cozy. Candles and candle holders make traditional furniture look elegant, classy and inviting! I also love using votive candle holders! These are my newest favorites! They are frosted with gold specks on the inside and a geometric surface! Add a couple of table runners to your table or one long one down the middle to add texture and warmth. Use classic white or a contemporary pattern. 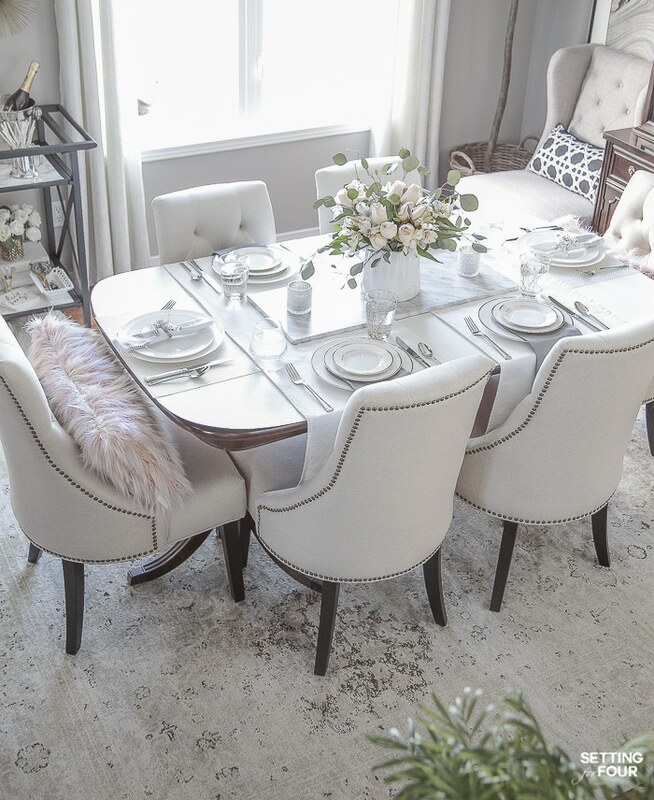 I love adding a table runner to my dining table to connect the middle table settings! This lets you skip placemats too! 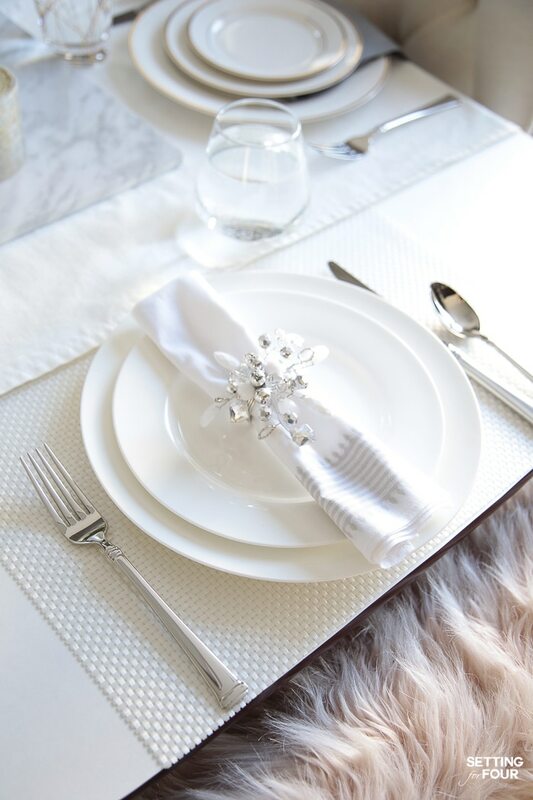 These white with gray border napkins add a gorgeous touch to our dining room – I really love them! Adding some fun and fabulous napkin rings also amp up traditional styled furniture! Don’t overlook the power of these accent pieces. They all add to a well rounded, layered dining room that’s inviting and one you LOVE to be in and entertain in! 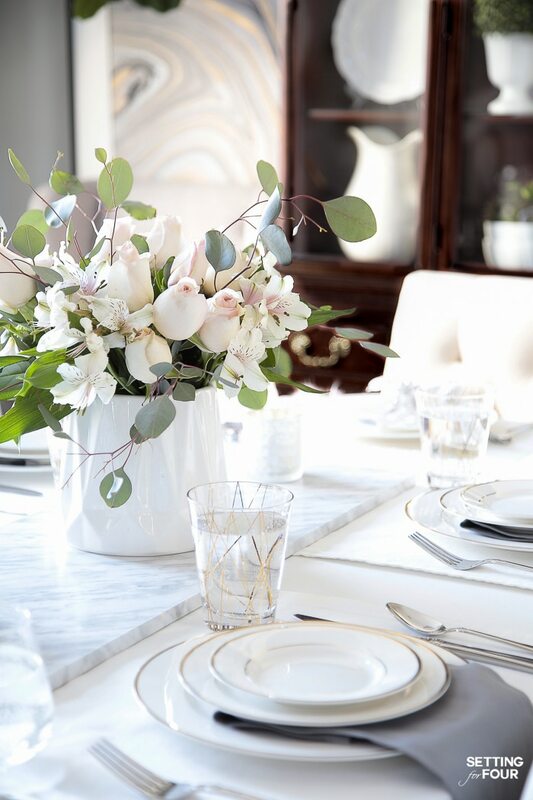 Select dinnerware, glassware and flatware to make your traditional furniture pop. You can never go wrong with classic white. Adding a pop of color with printed salad plates is a way to add style too. 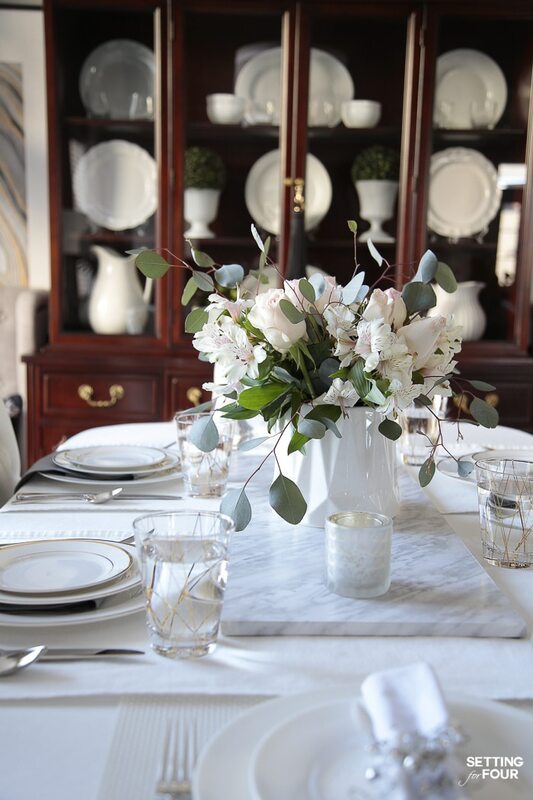 I love using timeless white dinnerware to lighten and brighten our dining room furniture! Thank you to my friends at Mikasa for sending me these gorgeous gold rimmed dishes – they are stunning and add a bit of glimmer and shimmer to our dining room! I just love their simple, sophisticated style. 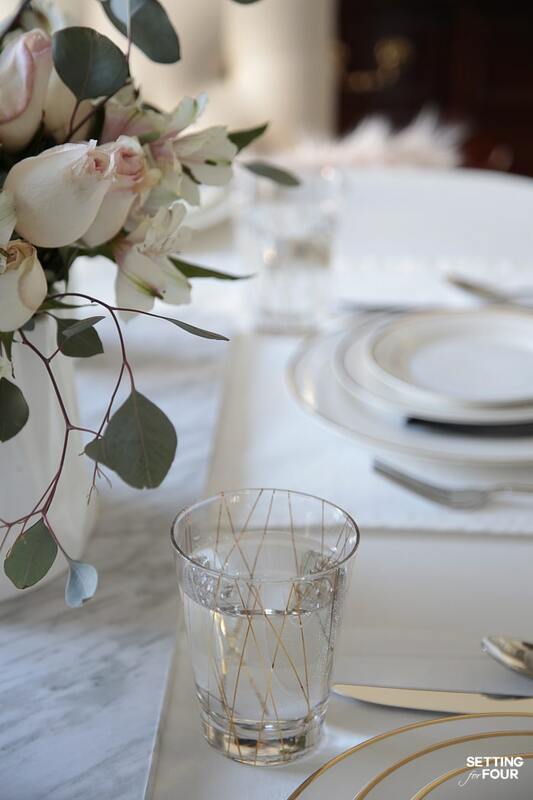 I love layering these contemporary gold line glasses from Mikasa at my table settings – they are so fun and add gorgeous glam style. And this handsome Mikasa silver colored stainless steel flatware has such a classic look! I love the timeless pattern! This flatware that goes with everything! Mixing metallics is a hot design trend this year so don’t be afraid to mix gold, brass, silver, pewter, rose gold and copper together. Lighting is the jewelry of the room! I added a large drum pendant to our dining room to update the furniture. Sputnik pendants, glam crystal pendants and lantern style lighting are all gorgeous ways to update traditional dining room furniture! 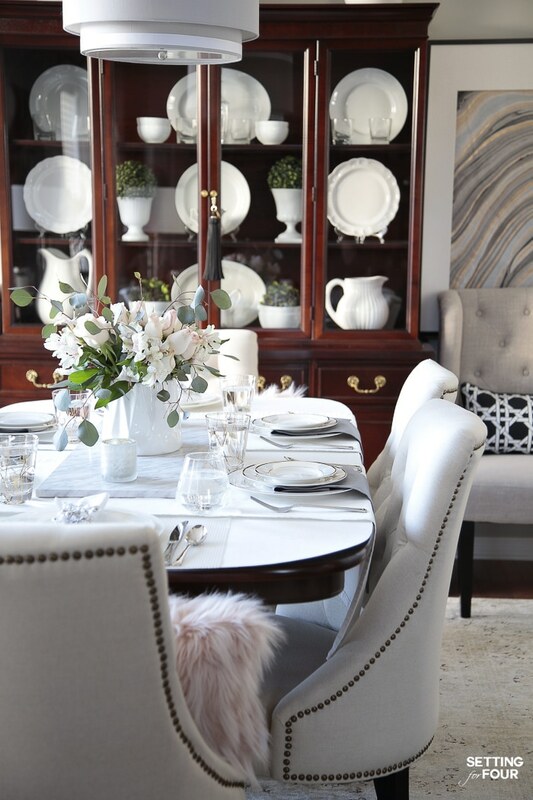 I hope you like my design tips on how to update a dining room and dining room furniture!